In 1891 Cross moved permanently to the south of France where he settled in a small hamlet, overlooking the sea, on the Côte d’Azur. The move to warmer climes was necessitated by a debilitating arthritic condition which had aged him prematurely. However, despite the pain associated with this condition, Cross was obviously a delightful man. One of his many friends wrote that ‘In Cross’s company, confidence made the shyest and most reserved as cheerful and talkative as children’. Cross was quickly followed to the south by Paul Signac who rented a house near his in the (then uncelebrated) village of Saint-Tropez. The two men, who enjoyed a very close relationship, delighted in the special qualities of the Mediterranean light, the luminosity of which they captured using their particular brand of neo-impressionism to produce a scintillating surface of small blocks of colour. Here, on the shores of the Mediterranean, they created their vision of a contemporary Eden. 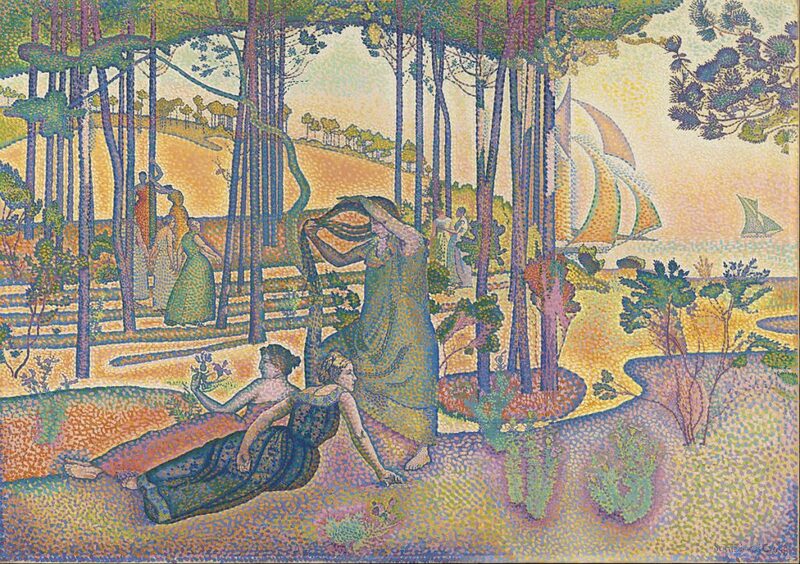 Cross and Signac shared a passion for anarchism and at the time that Cross was painting this picture, Signac was also engaged in the representation of his own socio-political utopia – a huge work set in Saint-Tropez entitled In the Time of Harmony to which a challenging subtitle was added – The Golden Age has not Passed; It is still to come. Signac’s vast work is much more overtly political than The Evening Breeze but Cross was engaged in a similar enterprise; we need not look to the past for ideals of harmonious beauty and social ease, we can attain our own Golden Age here and now.